Zero-inflated negative binomial regression is for modeling count variables with excessive zeros and it is usually for overdispersed count outcome variables. Furthermore, theory suggests that the excess zeros are generated by a separate process from the count values and that the excess zeros can be modeled independently. In addition to predicting the number of fish caught, there is interest in predicting the existence of excess zeros, i.e., the probability that a group caught zero fish. We will use the variables child, persons, and camper in our model. Let’s look at the data. Zero-inflated Poisson Regression – Zero-inflated Poisson regression does better when the data is not overdispersed, i.e. 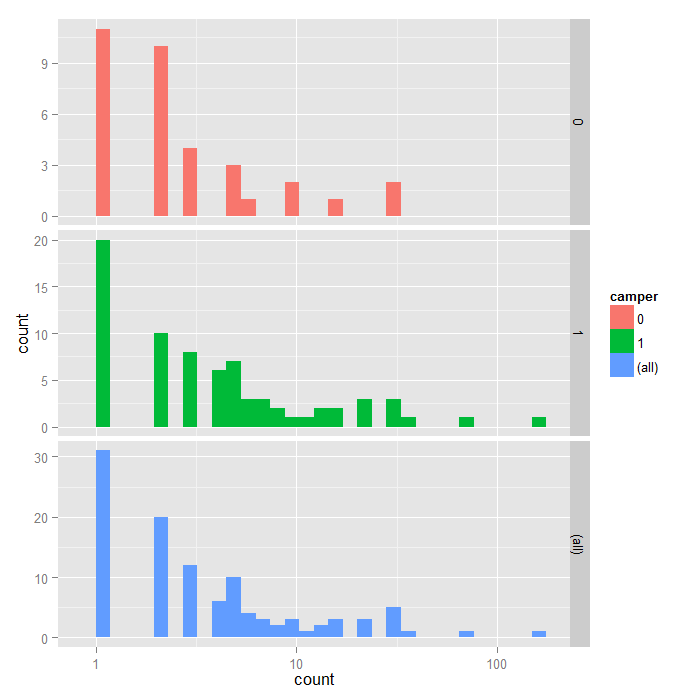 when variance is not much larger than the mean. Finally, note that R does not estimate \(\alpha\) but \(\theta\), the inverse of \(\alpha\). Now let’s build up our model. We are going to use the variables child and camper to model the count in the part of negative binomial model and the variable persons in the logit part of the model. We use the pscl to run a zero-inflated negative binomial regression. We begin by estimating the model with the variables of interest. ## (Intercept)    1.603      0.836    1.92    0.055 . The output looks very much like the output from two OLS regressions in R.
Below the model call, you will find a block of output containing negative binomial regression coefficients for each of the variables along with standard errors, z-scores, and p-values for the coefficients. A second block follows that corresponds to the inflation model. This includes logit coefficients for predicting excess zeros along with their standard errors, z-scores, and p-values. All of the predictors in both the count and inflation portions of the model are statistically significant. This model fits the data significantly better than the null model, i.e., the intercept-only model. To show that this is the case, we can compare with the current model to a null model without predictors using chi-squared test on the difference of log likelihoods. From the output above, we can see that our overall model is statistically significant. Note that the model output above does not indicate in any way if our zero-inflated model is an improvement over a standard negative binomial regression. We can determine this by running the corresponding standard negative binomial model and then performing a Vuong test of the two models. We use the MASS package to run the standard negative binomial regression. 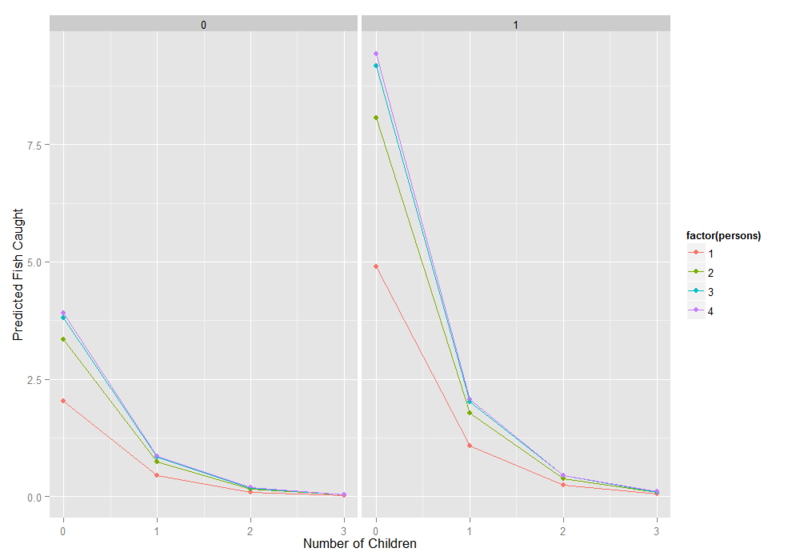 For these data, the expected change in log(count) for a one-unit increase in child is -1.515255 holding other variables constant. A camper (camper = 1) has an expected log(count) of 0.879051 higher than that of a non-camper (camper = 0) holding other variables constant. The log odds of being an excessive zero would decrease by 1.67 for every additional person in the group. In other words, the more people in the group the less likely that the zero would be due to not gone fishing. Put plainly, the larger the group the person was in, the more likely that the person went fishing. The Vuong test suggests that the zero-inflated negative binomial model is a significant improvement over a standard negative binomial model. We can get confidence intervals for the parameters and the exponentiated parameters using bootstrapping. For the negative binomial model, these would be incident risk ratios, for the zero inflation model, odds ratios. We use the boot package. First, we get the coefficients from our original model to use as start values for the model to speed up the time it takes to estimate. Then we write a short function that takes data and indices as input and returns the parameters we are interested in. Finally, we pass that to the boot function and do 1200 replicates, using snow to distribute across four cores. Note that you should adjust the number of cores to whatever your machine has. Also, for final results, one may wish to increase the number of replications to help ensure stable results. ## structure(c(1.6028, -1.6663), .Names = c("(Intercept)", "persons"
The results are alternating parameter estimates and standard errors. That is, the first row has the first parameter estimate from our model. The second has the standard error for the first parameter. The third column contains the bootstrapped standard errors, which are considerably larger than those estimated by zeroinfl. Now we can get the confidence intervals for all the parameters. We start on the original scale with percentile and bias adjusted CIs. We also compare these results with the regular confidence intervals based on the standard errors. The bootstrapped confidence intervals are considerably wider than the normal based approximation. The bootstrapped CIs are more consistent with the CIs from Stata when using robust standard errors. Now we can estimate the incident risk ratio (IRR) for the negative binomial model and odds ratio (OR) for the logistic (zero inflation) model. This is done using almost identical code as before, but passing a transformation function to the h argument of boot.ci, in this case, exp to exponentiate. To better understand our model, we can compute the expected number of fish caught for different combinations of our predictors. In fact, since we are working with essentially categorical predictors, we can compute the expected values for all combinations using the expand.grid function to create all combinations and then the predict function to do it. Finally we create a graph. The zero inflated negative binomial model has two parts, a negative binomial count model and the logit model for predicting excess zeros, so you might want to review these Data Analysis Example pages, Negative Binomial Regression and Logit Regression. Since zero inflated negative binomial has both a count model and a logit model, each of the two models should have good predictors. The two models do not necessarily need to use the same predictors. Count data often use exposure variable to indicate the number of times the event could have happened. You can incorporate exposure (also called an offset) into your model by using the offset() function.